Sebastian Krinner is the first winner of the Lopez-Loreta Prize at ETH Zurich. The physicist has a clear goal: he wants to build a quantum computer that is not only powerful, but also works without errors. "Here, at the very bottom of this white container, are the circuits," explains Sebastian Krinner with evident pride, after guiding the visitor through the large room full of high-tech equipment. The physicist has set up his experiment at the back of the Quantum Device Lab – and he is likely to spend countless working hours here in the coming years. After all, this year Krinner is the first recipient of the prestigious Lopez-Loreta Prize, which will enable him to push forward with his project at ETH Zurich over the next few years. Krinner is pursuing an ambitious undertaking. 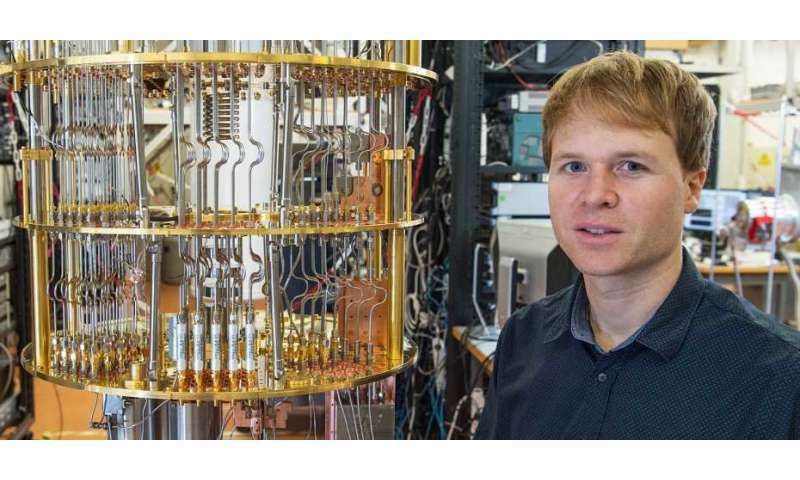 As senior scientist in Andreas Wallraff's research group, he aims to bring the development of quantum computers a major step further. "When it comes to quantum computers, the aim is usually to control as many qubits as possible," he explains. "However, people often forget that qubits do not work flawlessly as carriers of quantum information." The fragile quantum states can be disrupted quite easily, allowing inaccuracies and incorrect information to creep into calculations. So how can this error rate be kept as low as possible? Krinner aims to show that this can be achieved with the aid of logical qubits. A logical qubit comprises multiple interconnected qubits that work together as a single qubit, but in a more stable manner and thus less prone to error. However, this is easier said than done. First, the individual qubits must already have a high level of reliability before they can be interconnected. If they have an error rate of more than one percent, the connection to a logical qubit is actually counterproductive – the error rate would then increase instead of falling. In addition, the qubits must be connected in a very small space. The control of the flat quantum mechanical elements thus becomes much more challenging. Krinner is currently working on connecting a few qubits to logical qubits and experimentally verifying their behaviour. In the white container, the heart of his test system, the qubits are cooled to unimaginably low temperatures of just a few millikelvin – in other words, almost to absolute zero. Attached to a futuristic-looking construction and controlled via numerous fine coaxial cables, the qubits are then quantum mechanically interconnected into the desired form. The world of quantum physics has fascinated Krinner since he began studying physics in Regensburg and Paris. He has been able to work with a wide variety of systems during his time at ETH. As a doctoral candidate under Tilman Esslinger, he worked with ultracold atoms as quantum mechanical objects that are caught and cooled in laser traps. Under Wallraff, he now works with superconducting circuits, which he is able to display on his desk for demonstration purposes. "There is a lot going on in this type of work," explains Krinner. "I really enjoy the variety." From the theoretical work to the planning and implementation of experiments, as well as the construction of complex experimental tests and the fabrication of quantum mechanical circuits in the cleanroom laboratory – the range of tasks the researcher must master is wide. But Krinner has a clear vision: if the development of logical qubits proceeds as planned, he aims to incorporate these into a more powerful quantum computer for the second part of his project. "Quantum computers have great technical potential, as they are able to solve complex and time-consuming computational tasks much more efficiently than conventional computers," explains Krinner. "They are also very inspirational from a scientific perspective, as the development of these machines provides us with many new insights into how physics works in these fields." However, Krinner still has plenty of groundwork to cover before he can bring his vision to life. Still, the Lopez-Loreta Prize gives him the opportunity to appoint two doctoral candidates to give his project an additional boost.